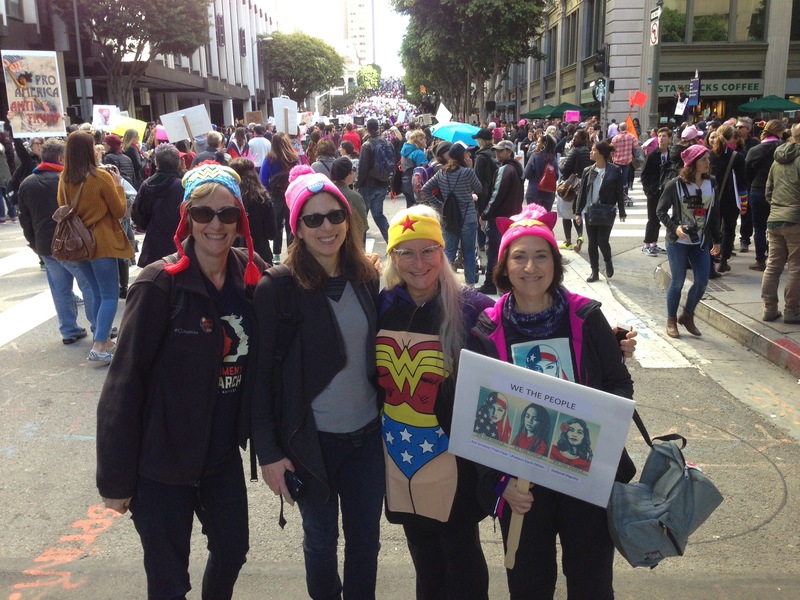 A week ago Saturday, I participated in the Women’s March L.A. with two dear friends from college (one my former roommate) and another long-time local friend. A protest march with 750,000 other people is probably the last thing I’d ever see myself doing. So why did I march? 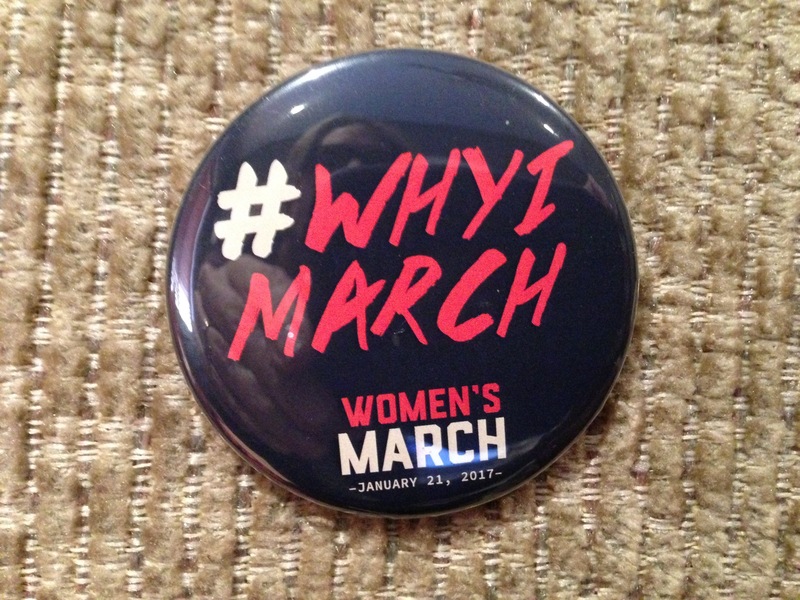 So, why did I march? For me, it came from a deeply spiritual place. A book that has profoundly influenced me is “Faith and Feminism” by Helen LaKelly Hunt. See Alive and Well Women: Our First Grant! Hunt points out that early feminists were women whose faith propelled them to action in areas of human rights, such as the abolitionist movement. The second wave U.S. feminist movement became secularized in the 60s. Elsewhere in the world, however, feminism and faith continue to be more closely aligned. Through the lives of some early faith-based feminists, Hunt illustrates the “journey to wholeness” which she proposes as a structure for both personal evolution as well as for bridging the religious-secular split in modern feminism as a whole. The five stages of the journey to wholeness are (1) pain, (2) shadow , (3) voice, (4) action, and (5) communion. My journey to the Women’s March started with a growing recognition of pain. I have challenged myself, particularly over the past 10-15 years, to cultivate relationships with a wide spectrum of people representing other religions, ethnicities, gender and sexual orientation. Through these relationships, I have become acutely aware that I largely won the birth lottery. I was born into a white, Protestant, Republican, middle-class, educated family in the United States of America, and for most of my life I have been blissfully oblivious of this great privilege. Other than some bias I encountered in my professional life as a woman, I have not faced the severe discrimination, mistreatment or hardship, even hatred (some of it on a daily basis) that my diverse circle has forced me to recognize. During the course of the most recent presidential election and transition, my pain only increased as I witnessed the escalating racist, misogynist, homophobic rhetoric, and saw the effect on people I’ve grown to cherish as friends. I increasingly sensed this intense pain pushing me toward a doorway to action, demanding a deeper meaning and purpose to my life. I thought and prayed daily about what Jesus would do, and discerned a growing conviction to use my voice to speak my truth. I wrote about this in Speak Up!. Finding my voice means finding the courage to tell my story in an authentic way. It’s somewhat frightening writing this post, even having cordial conversations with close friends and family who do not share many of my political views. I worry about damaging or losing those relationships by speaking my mind. I’m learning to see these as opportunities to practice speaking my truth with love, and with respect for other viewpoints. I have now come to the stage of action. Helen Hunt writes that once we have found our true voice, it’s time then to act and to bring our values into the world in a concrete form. For me, the Women’s March was the first step (no pun intended) in that process. I understand that big shifts are underway in our country as we move from more liberal philosophies and policies to more conservative. I have concerns, but I am not deeply disturbed. This, after all, is what democracy is all about. I pray that these macro shifts bring the intended economic benefits to our country. However, I do feel deep concern that, in the midst of these shifts, there may be severe displacement and hardship on the poor and powerless and our planet. Perhaps we are moving toward a country where the government no longer provides the same level of safety net, in which case I feel called as a Christian to step into the breach. Part of my responsibility as a Christian is to help care for, and defend, the “poor'” which includes a broad range of disadvantaged groups. My biggest fear, however, is that the treatment of certain classes will be worse than neglect; rather, that government-sanctioned or government-led persecution may result. I worry about the erosion of what I believe to be deeply valued democratic principles. My fear of this has only escalated in the week since the inauguration. And so I marched. It was a day I’ll never forget – a glorious, crisp sunny day in Los Angeles, a brilliant miracle in the midst of several cold, gray days of heavy rain. My college friends came from out of town to join me and another close friend, and we met my niece and grandniece downtown. We wore Wonder Woman accessories. The mood was upbeat and positive, the signs hilarious, heartrending and clever, and a pervasive optimistic hopefulness settled on the huge crowd (and in which I never felt the slightest bit unsafe). I didn’t agree with everyone and everything at the March. But my participation represented a show of support for those whose voices may not be heard and who may be in danger. It represented a celebration of my constitutional right to free speech and assembly. It represented expression of a deeply felt conviction that my faith compelled me to show up and speak up. It represented my steely resolve, along with my close-knit group of females beside me, that we will not cede ground that we and other women before us have fought so hard to achieve. I am sad, but not deterred, that some considered the march disrespectful, un-American, unpatriotic, or sacrilegious. For me, it was exactly the opposite. And by the grace of God, look out world, I’m only getting started! I recently attended my first bar mitzvah, for our grandnephew Ryan. I knew generally that the bar mitzvah is the ceremonial marking of a Jewish boy’s religious coming of age (at 13). I did more research beforehand and learned about the meaning behind parts of the ceremony. And as I bragged to my niece Tamra (Ryan’s mom), when I was in fourth grade, we lived in a predominately Jewish community in Silver Spring, MD, and at one point in my elementary school career, I could recite the entire Hebrew alphabet and spin a dreidel like no tomorrow. So, I felt as prepared as any gentile could be. However, I wasn’t expecting such an emotional, spiritual ceremony, or such a great party! Ryan’s mother Tamra came from a Christian background and his father Mike (her husband) from a Jewish. Ryan was not raised in either faith, although he was exposed to elements of both. Neither Mike, nor Mike’s two siblings, had a bar or bat mitzvah. 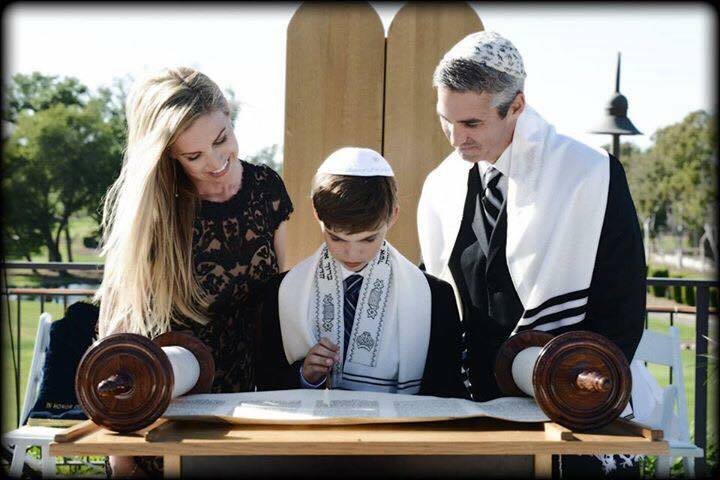 Imagine the surprise when Ryan, as a very young boy, announced he wanted a bar mitzvah. (Even more shocking, he wasn’t aware that gifts and parties were involved) Because of the huge effort involved, Mike and Tamra tried to talk him out of it, but finally relented after months (even years) of Ryan’s begging. Ryan’s Hebrew teacher, whose more typical experience was tutoring young people pressured to have bar mitzvahs by their families, relished the experience of working with this diminutive boy with a big passion for his studies. By the time Ryan was midway through his lessons (about an 18-month process to prepare for the bar mitzvah), his younger sister Erin decided she would have a bat mitzvah and embarked on her own training. Having just completed a study of Exodus with my church, I was eager to see how the Old Testament rituals and traditions might be expressed in the bar mitzvah. It was moving to observe the customs, passed on for generations and thousands of years. Ryan wore a Talit (prayer shawl) for the first time, presented as a gift from his Jewish grandparents. As part of the ceremony, Ryan received the Hebrew name that he chose for himself, David Solomon, in honor of his cousin (and my stepson) David. (Here’s where I first lost it). The ceremony continued with Hebrew blessings, prayers, and songs, the opening of the Holy Ark and the passing of the Torah from generation to generation (starting with Ryan’s grandfather and then from family member to family member, ending with Ryan). Ryan then read from the Torah, that week’s passage from Leviticus. I learned later that he was reading from the original Hebrew, containing no vowels, which meant he had to memorize the entire passage and follow along with a pointer, right to left. Tamra, Mike and Erin each rose in turn and, while standing next to him, shared reflections on Ryan and his accomplishment. I couldn’t help but be struck by Ryan’s face, as he was able to graciously and openly (and without any apparent embarrassment or discomfort) receive public words of loving tribute from the most important people in his life. (That’s when I really needed that package of tissues). Following the ceremony was a party for the ages, complete with dancing, dinosaurs (Ryan aspires to be a paleontologist and that’s a whole ‘nother story), food and games. Ryan entered the hall to the heroic Jurassic Park theme and thunderous applause. We lifted Mike, Tamra, Erin and Ryan on chairs, we danced the hora, and we celebrated faith, family, and Ryan. I danced until midnight, came home with my hair and make-up in shambles, with sore feet and a tender right hip (primarily from overexertion doing the Thriller dance number and the Electric Slide, both of which, in my opinion, I slayed) and hadn’t had that much fun in ages. The more I reflect on Ryan’s accomplishment, the more I am impressed. As a pre-teen boy, Ryan chose a very difficult path, not for rewards or recognition, but for the journey and its significance. In his social world, his choice could have easily caused him to be ostracized rather than admired. He clearly heard a deep spiritual calling, and not only did he answer the call, but he followed it through. 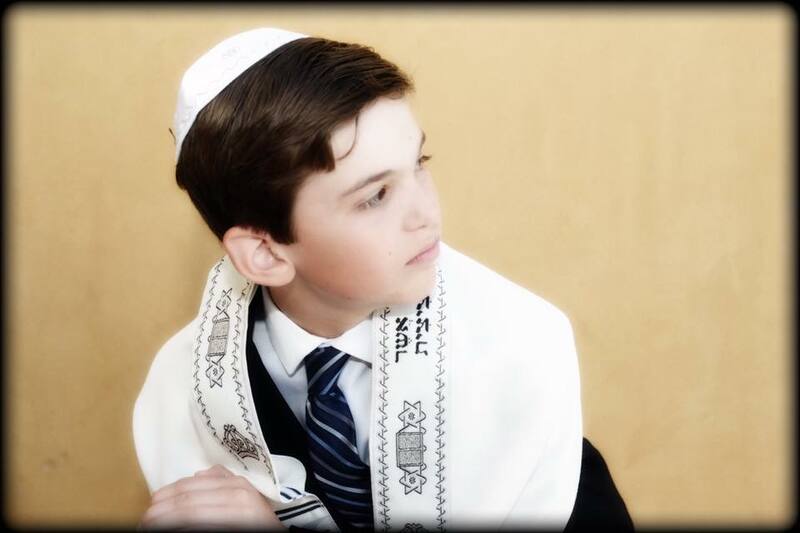 The grueling preparation and study required for his bar mitzvah was on top of an already heavy scholastic and extra-curricular schedule, and in the midst of significant family struggles. It is inspiring to see such spiritual depth and maturity in one so young, and I am proud to be part of his mishpacha (which according to Google, means ‘family’ in Hebrew). Mazel tov, Ryan!